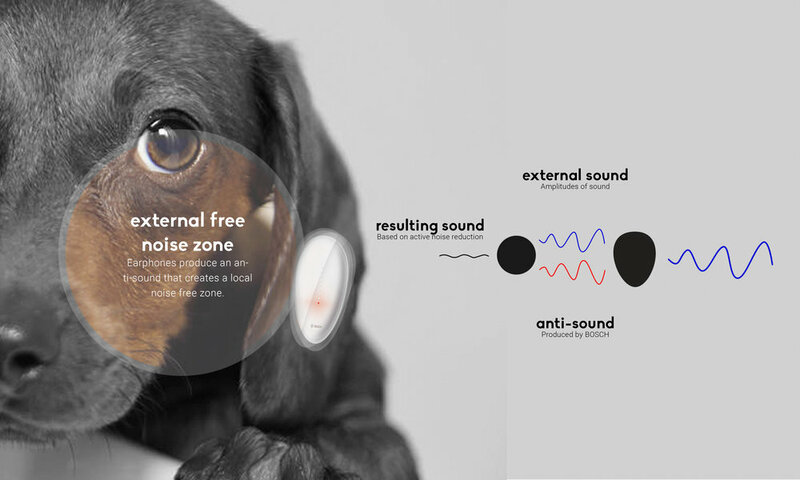 "Using the strong connection between pet and owner, BOSCH can act as an intermediar and facilitates care and love between them. " A 5-week follow up project after the strategic design project, which targeted the development of a new brand language for BOSCH. This visionary project aimed to find a new market opportunity for BOSCH in order to increase their product portfolio. Executed at the Umeå Institute of Design in Sweden, from April 2017 till May 2018. Nowadays, the dog gives an anti reaction when a pet owner has to brush their teeth. If dental care is important to keep a beloved pet healthy, in what way can BOSCH support pet owners and make sure their dogs keep their teeth healthy, without causing anti-reactions? BOSCH Kexi is a new dental care tool that kills bacterias inside the dog’s mouth without harming it. By using ultraviolet (UV) light, the bacterias will be killed and prevents them from affecting a bad oral hygiene. 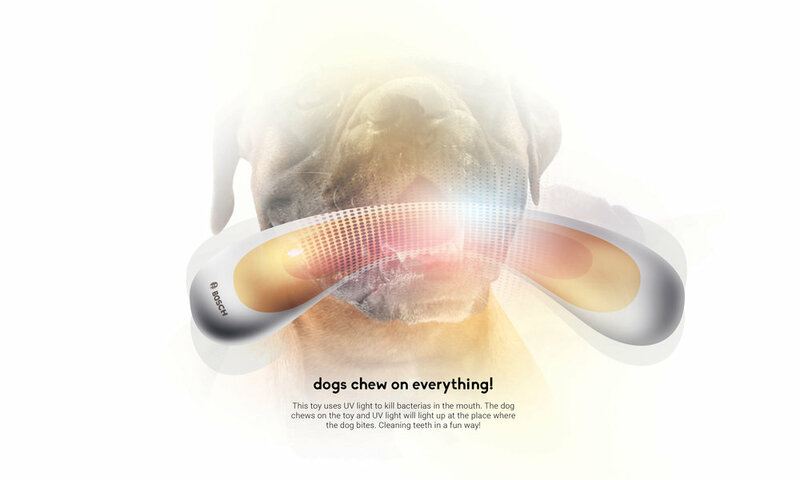 BOSCH Kexi allows the dog to clean their own teeth by chewing on an abstract bone-shaped hard rubber shell that emits UV-light. After deciding on the general direction of pets, a more specific research workshop was held with 11 students and 2 tutors. When documenting the information after this research workshop, more market and technology research was done to get a clear understanding of what the design opportunity could be. A research was held with 11 students and 2 tutors. The aim of this research workshop was to gain a better understanding what the needs, behaviours and emotional values are in the different pets. The workshop functioned as an explorational tool to see if the personal thoughts were true. The 11 students and 2 tutors were divided in pairs, were appointed to a certain pet and received a stack of inspirational images related to their pet. They than got 5 minutes for each question to come up with solutions. After they finished answering four questions, they had to present their best solution. After this research workshop, a rapid ideation started with the aim of exploring the results that came out of the research workshop. 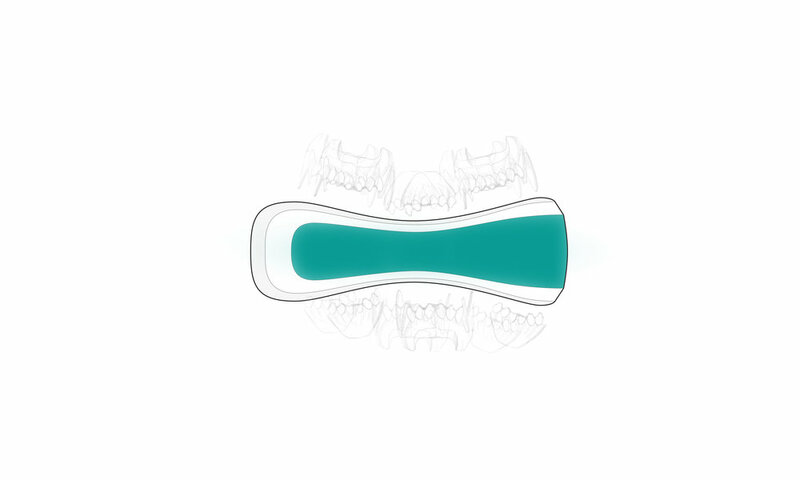 The idea of a non-intrusive dental care toy for dogs was chosen for several reasons. Not taking care of the dental hygiene from the pet can cause long-term negative effects and results in a bad visible oral hygiene. This concept is also the most challenging based on technology development. If BOSCH succeeds to manufacture this, it will definitely bring the fascination they are striving for. The exploration phase started where the identified design opportunity has been explored with analogue sketches , paper mock-ups, foam models and a final digital form exploration (2D + 3D) . The product exists of three parts; an outer hard rubber shell, a middle semi-transparant rubber and the BOSCH UV-light. With a three point fixing mechanishm, one screw at the bottom and two fixing points at the top, the BOSCH UV-light is protected. Also parts are locked together by the shapes of the parts. The middle part is more narrow than the end, which makes it hard to move up and down. With a firm push, the middle part can be clicked in the outer shell. 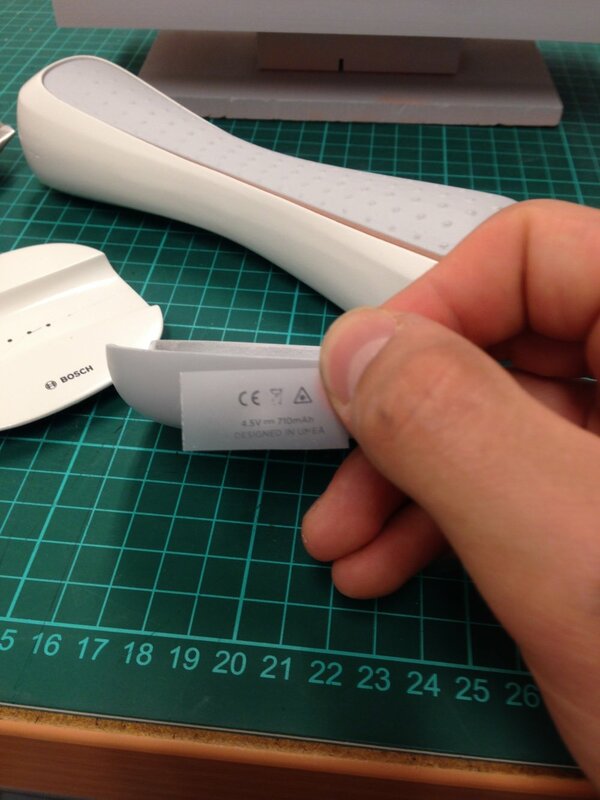 The two outer parts are replaceable and can be produced by different manufacturers. BOSCH will put their effort and technology in the UV-light module, which can possibly be patented and give them ownership of the UV-light pet toys on the market. Physical models were made to define size. 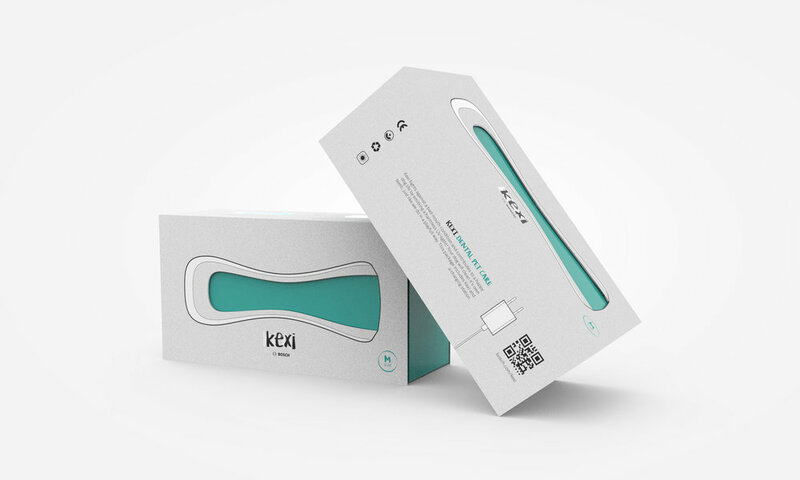 BOSCH Kexi is a new dental care tool that kills bacterias inside the dog’s mouth without harming it. By using ultraviolet (UV) light, the bacterias will be killed and prevents them from affecting a bad oral hygiene. Nowaydays, the dog gives an anti reaction when you have to brush their teeth. BOSCH Kexi allows the dog to clean their own teeth by chewing on an abstract bone-shaped hard rubber shel that emits UV-light. KEXI comes in three different sizes. When purchasing the kit, the customer can choose between the sizes S, M or L. These sizes only affect the volume of the outer shell. The UV-light BOSCH is producing, will always be the same size and fits in all the different sizes. A range of modular outer shells and one universal inner UV-light makes the life length of BOSCH Kexi also longer. The customer does not have to buy a new, relatively expensive, inner UV-light when the outer shell is bitten in pieces. In this case, the customer canbuy a new outer shells when it needs to be replaced. Also, the modularity of this concept makes it able to let BOSCH Kexi grow with your dog. When the dog grows and can bite with more force, the outer shell can be replaced for a larger size with more hard rubber volume. BOSCH Kexi exists out of five compartments. 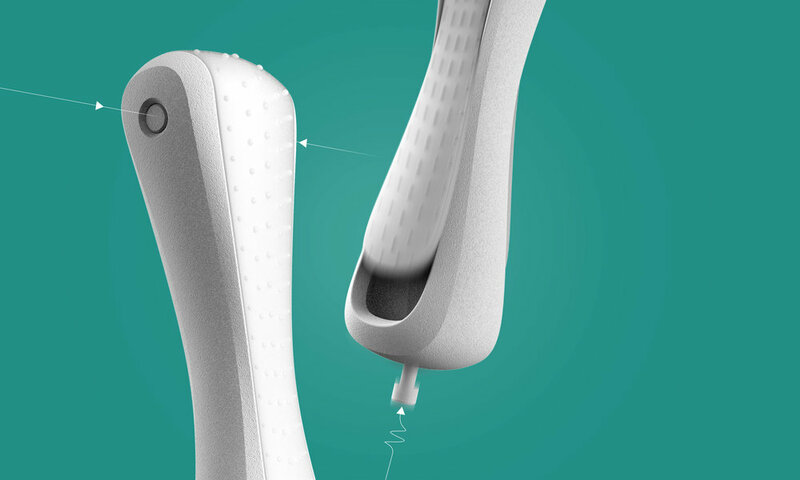 Every compartment contains two pressure sensors, one on each side of the product. 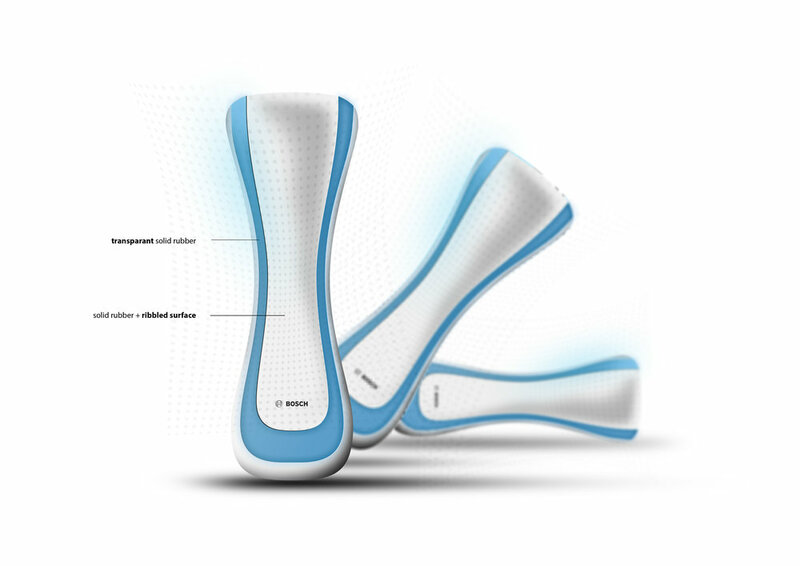 When the pressure sensor is activated with the force of biting, the UV-light will be emitted. KEXI is divided in compartments so the dog will not see much light when he bites on the product. This will keep anti-reactions on a low level and improve the succes of the product. Since the dog bites in the middle, with a small amount of teeth, only the middle compartment will emit UV-light. The light will only emit in the dog's mouth, which makes him/her unaware of it's use. A dog bites with a large amount of teeth on the side of the product and bites in the middle of two compartments. Two compartments will emit light. A large dog or hound can bite quickly on the casing which causes the whole product to emit light. Though, it's recommended to avoid this due to possible anti-reactions of a dog. As described before, the shells can be replaced when it’s torn apart or when the dog has grown. 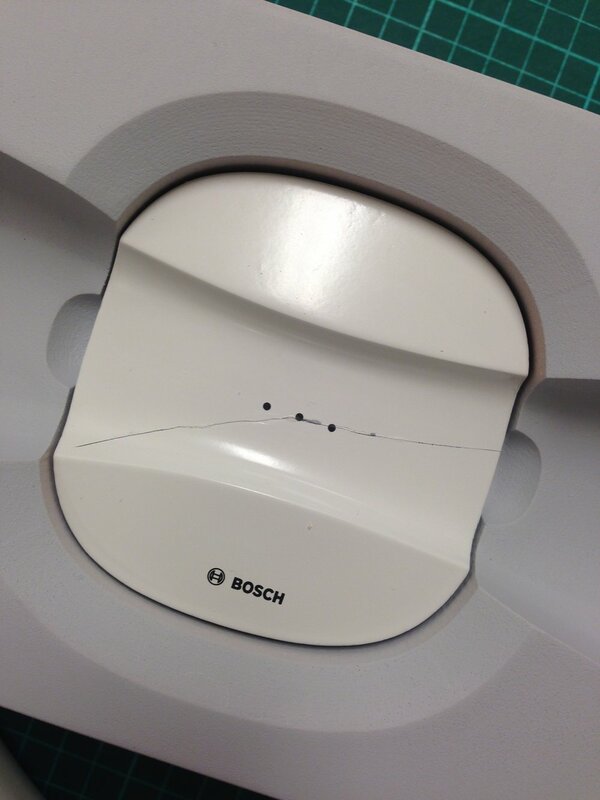 The shells can be detached from the BOSCH UV-light by unscrewing the bottom screw. When this screw has been taking out, the two top buttons can be pushed and the two shells can be seperated. Since KEXI will be used without a cable, an accu needs to be integrated in the product to provide the neccesary power. A decision has been made to use induction charging as a delivery principle for power. The most important reason to choose induction charging is vulnerability. A dog does not always know how to use this product and where to bite on it. When there is no external charging point, the dog can not chew on the components of the external charging point. When using induction charging, which does not need an external charging port, the chances a dog breaking the charging point is way reduced. Since the charger is a product is a product that be placed on the countertop, and therefore be part of the Home Appliances, the design is based on the home appliance design language. 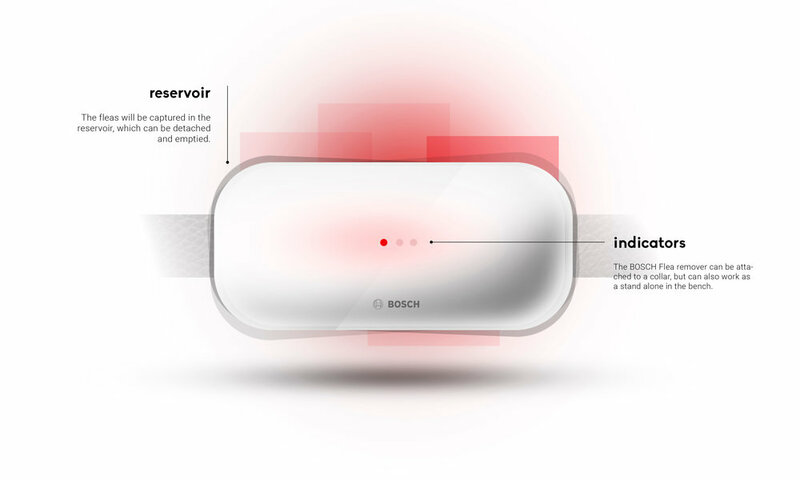 To enhance the fascination part BOSCH is striving for, the packaging was designed with the word ‘fascination’ in mind. The goal was to create a packaging that resembled what is inside and when an interaction takes place, it resembles what the product stands for. The first interaction with BOSCH KEXI is when a customer sees the packaging in the shop. The packaging of KEXI is basic and contains a wrap and a box. Inside the wrap is a hole that represents the part that emits the UV-light. When the box, that is inside the wrap, is being pulled out, the printed gradient on the box moves accordingly the movement. This means when the box is being pulled out, the visible colour through the hole in the wrap changes. This metaphoric principle resembles a light that will be turned on; an UV-light that turns on when interacting with it. The image below shows the architecture of the packaging. The box contains a vacuum-formed black tray that holds the charger and KEXI. Underneath the black tray, the cable of the charger, the manual and a warranty brochure is placed.. Opening the box is a secondary interaction with BOSCH KEXI. The first interaction is seeing the product standing on the shelf. The secondary interaction must give the customer a ‘wow-feeling’. The product is displayed in the tray in the charging position. In this way, the BOSCH logo on the charger is visible and the customer gets reminded of the brand. Also the bone and charger are catching all the attention since it’s surrounded by a black, matte plastic.